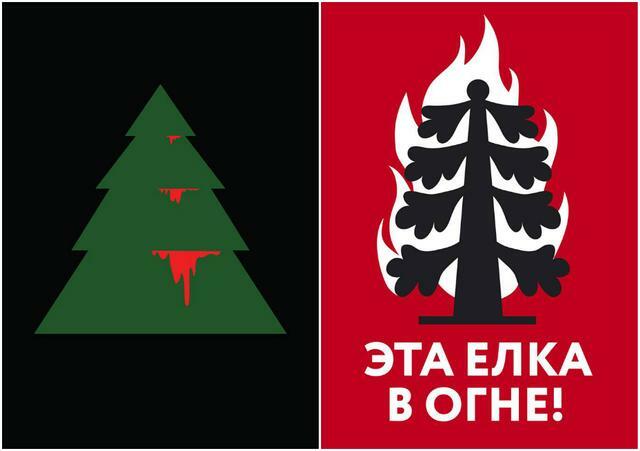 What is it about Ukraine’s revolutionaries that makes them more artistic than their status quo opponents? 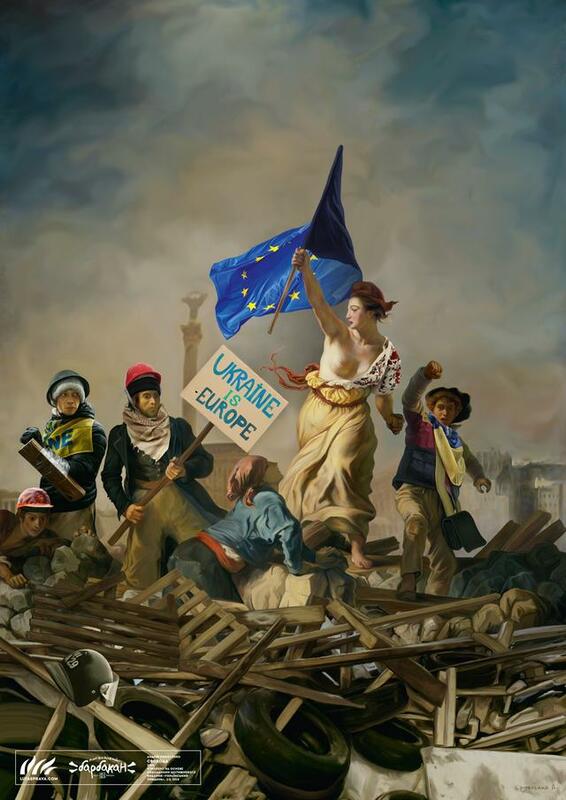 In the Ukrainian revolution in 2013-2014, as in many revolutions throughout world history, art had a special place. Rationalism and pragmatism have their limits; emotive principles do not. Rationalism and pragmatism don’t lend themselves to the artistic mind; emotive principles do. 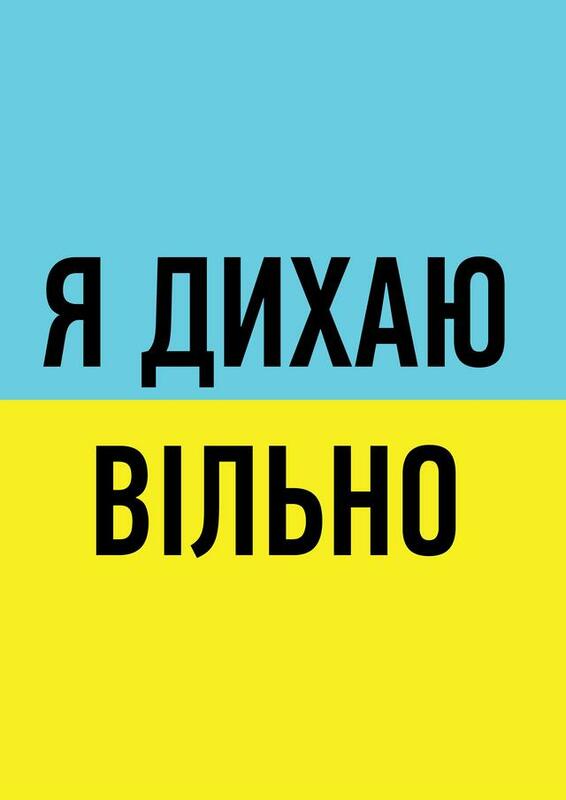 It is, perhaps, that fact which underpins the reality that in Ukraine, passionate political activists have always been recruited from the artistic community. 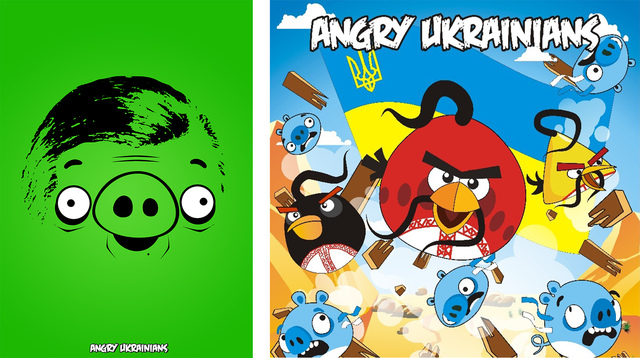 Ukrainian leaders and activists are often connected with art. It’s no happy accident that 17th century Cossack Hetman Ivan Mazepa was a composer, and that western Ukraine’s socialist movement stems from beloved poet and writer Ivan Franko (who unsuccessfully ran for office several times). As the Cossack state decayed, Ukrainians created a state through their art. In 2004, a stage, a microphone, a tent and a TV set became symbols of rebellion. For the people of Ukraine, the public memory of the Orange Revolution is impossible to cleave from the artistic experience of the insurgence. At Maidan Nezalezhnosti in Kyiv, famous Ukrainian singers performed in protest, singing patriotic and traditional songs alongside amateur artists; folk art masters at the Kyiv Conservatorium wove orange carpets; exhibitions at the Khreshchatyk presented a gargantuan angel hovering over the Maidan and protest slogans blown up into a 60-meter open letter to Vladimir Putin. The Maidan was wreathed in orange. 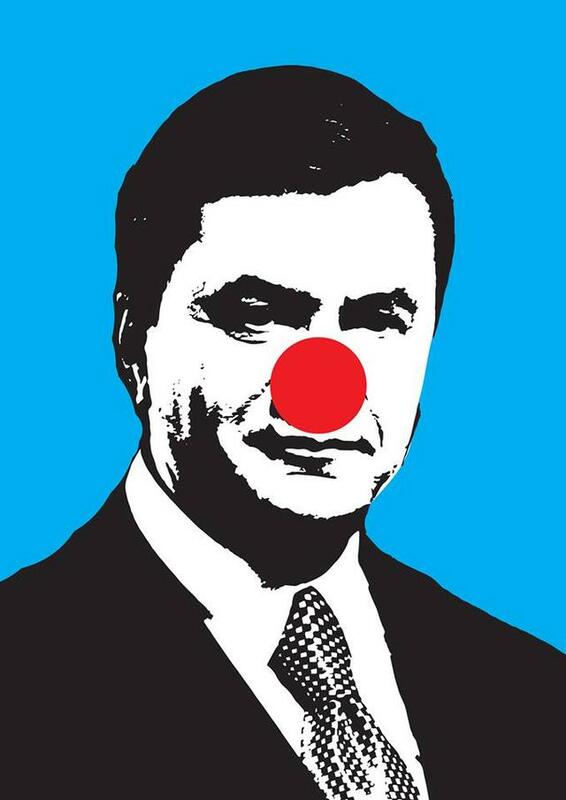 But just as art was used to subvert those in power, so, too, it was employed by supporters of Yanukovych. Almost every performance in Orange had an analogue in Blue & White. The traditional Ukrainian folk art and patriotic anthems were countered by traditional Russian (and, in some cases, Soviet) songs. 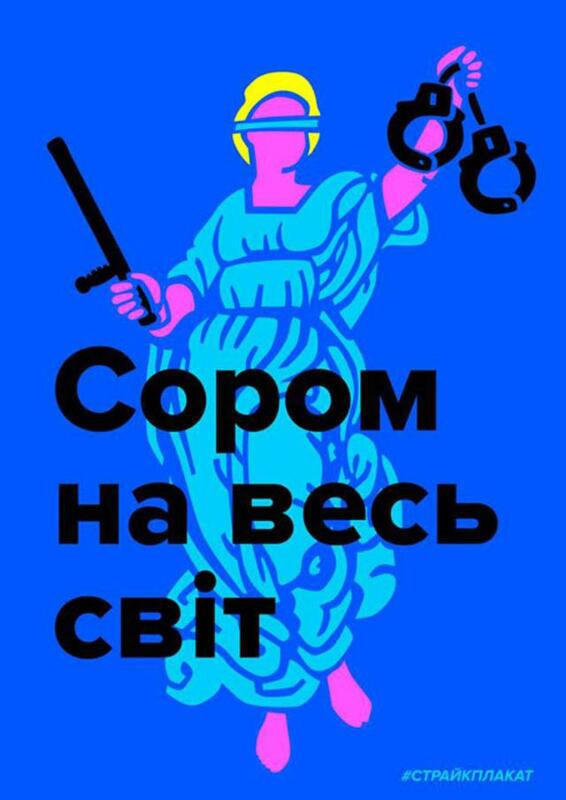 While the nostalgic Soviet-era songs of the Blue & White relied on old idealized mythologies from socialist times, the music of the Orange built a new world with its own myths and heroes, and governed by new rules: clean hands and bandits in prisons. Art’s new and old came into confrontation, exacerbated by a range of social, economic and primarily psychological factors. Broadcast nationwide via television and the internet, this artistic confrontation influenced politics. The 2013-2014 revolution sharpened the confrontations launched in 2004. Longer-lasting protests and mature civil and political motivation — as well as tragic self-sacrifice — stimulated fantastic creative expression from professional artists and ordinary Maidan participants alike. 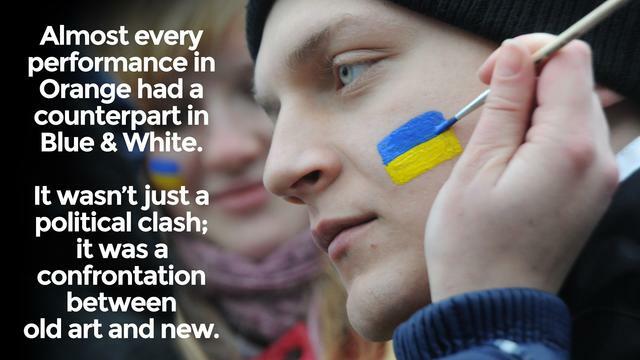 The Maidan itself turned into something of a canvas. Like in 2004, the square was the protest’s stage, its centerpiece a huge, metal New Year’s tree (the climbing of which became an official reason for the government’s dispersal of students in late November 2013). 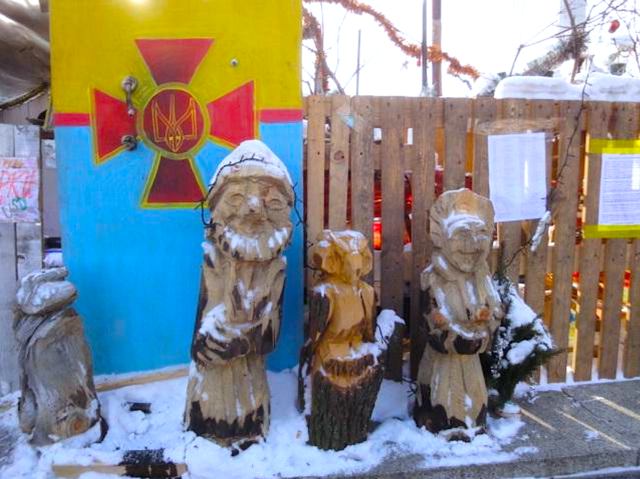 This tree was the main installation at the Maidan, though there were many others, including barricades or “geographic” installations — the creative construction of wooden plates with names of different cities, villages and city districts symbolizing unity of Ukraine. For the government’s forces to crack down on the protests, they’d be forced to destroy an artistic representation of the Ukrainian communities they’re meant to protect. 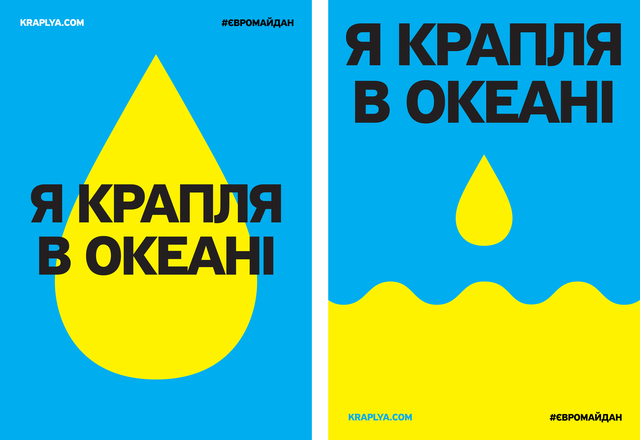 The creativity of Euromaidan manifested itself time and again, in medium after medium. Its instant dissemination through the Internet and exhibitions on the barricades of Maidan and at Hrushevskoho near Parliamentary Library. Wooden sculptures by Yaroslav, a master from Kolomyia, marble sculpture “New Ukraine” by French street sculptor Roti that depicts a woman emerging from the depths. These works are located at Instytutska. Protesters took to painting in all its different forms, from street art to ornamental to portraiture. 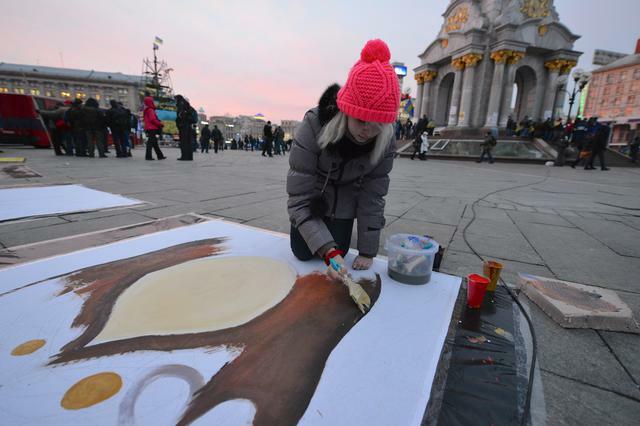 From the very beginning, painters worked at Maidan depicting the first peaceful days and further hot battles. Murals and graffiti appeared at once. Veterans of the Soviet war in Afghanistan who joined in the protests could request to have their tents artistically painted. When the protest’s first heroes emerged, portraits appeared in and around the square of cossack Mykhailo Gavruliuk and the “Heavenly Hundred” (an honorific name for Euromaidan’s fallen protesters). Oleg Smal, the painter, and Yuriy Zhuravl, the graphic artist and the leader of Rivne group OT VINTA, held exhibitions of their works at Hrushevskoho Street. 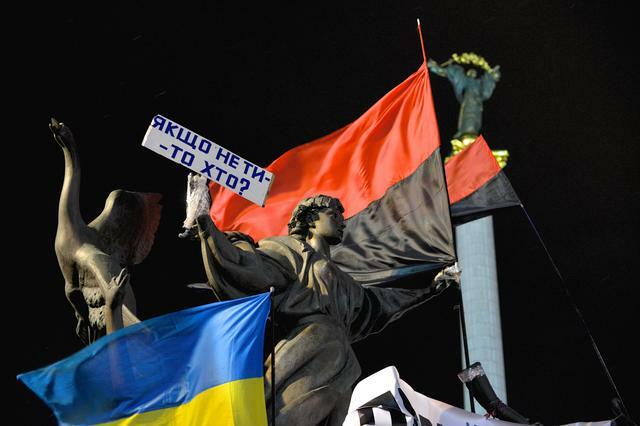 In February 2014, to support the will and the spirit of those on the front lines, activist and street artist Sociopath painted the trilogy “Icons of the Revolution” near the barricades at Hrushevskoho, adorned with the images of three titans of Ukrainian literature: Taras Shevchenko, Lesya Ukrayinka, and Ivan Franko. An artistic barbican formed in Khreshchatyk. Its erectors believed that fortification was essential to protect the creative intelligentsia from any potential crackdown on their artistic expression (which included art exhibitions and literary readings). The “Artistic Hundred” — a collective of young artists who creatively decorated shields and helmets of fighters — settled in the Ukrainian House. From the first revolutionary days, footage of Euromaidan was recorded, perhaps most notably through a collaborative initiative called BABYLON’13. Artists shot mini-documentaries free from the trappings of auteurism; others recorded with the express goal of recruiting viewers to become activists. In March 2014, audiences at the 11th International Festival of Documentaries on Human Rights were shown “Euromaidan: Rough Cut,” a kaleidoscope of snippets from future films about the protests; many of these cinematic sketches are expected to be spun into full-length documentaries about the grand and tragic period. Like in 2004, performances by singers and musicians on the Maidan stage played a major role unifying and motivating activists. December saw a special performance by famed Ukrainian rocker Sviatoslav Vakarchuk and his band Okean Elzy on December 15. On New Year’s Eve, nearly 500,000 people gathered in the square and sang the anthem of Ukraine, lighting the winter sky with raised torches. 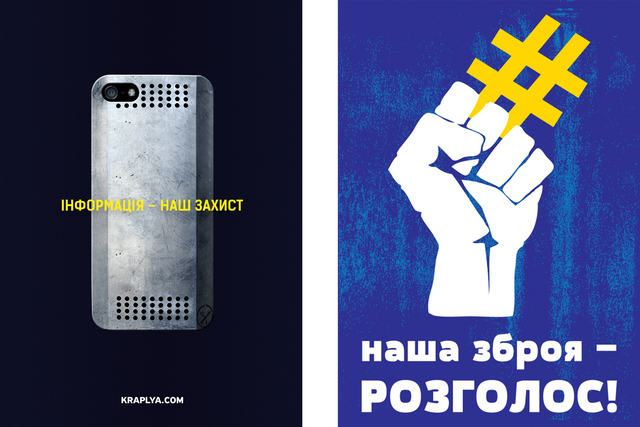 Besides performances on the stage, musical works related to Maidan immediately spread through the Internet. 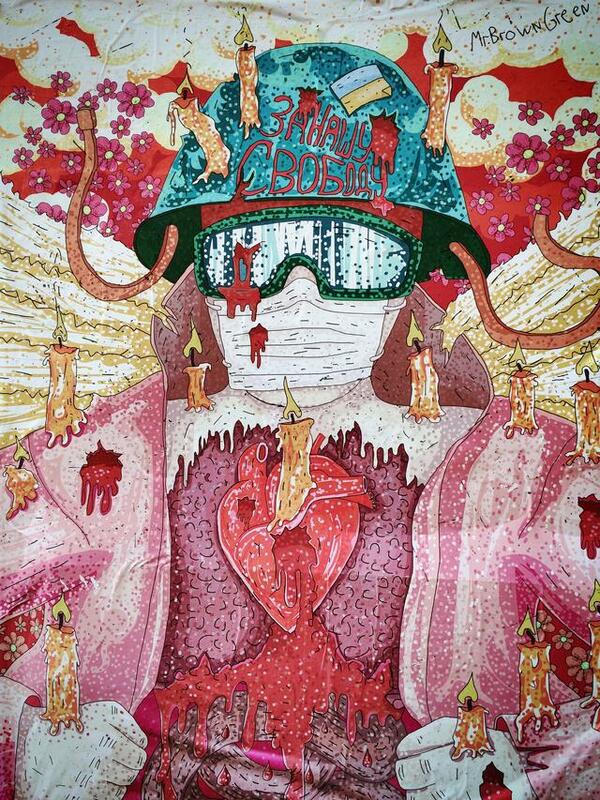 In memory of Sergiy Nigoyan, a Euromaidan activist who was shot by government forces in January 2014, noted Kyiv-based composer Valentyn Sylvestrov created the diptych “I vam slava, syni gory” (translated roughly as ‘power to you; dreams of pain’) and “So sviatymy upokoi” (‘be at peace with the saints’), in addition to two a cappella choral songs, “Hymn” and “Christmas psalm,” which were dedicated to the Maidan movement. Special note should be made of numerous performances on a yellow-and-blue piano that first appeared near the presidential administration building, where a musician played for police forces. 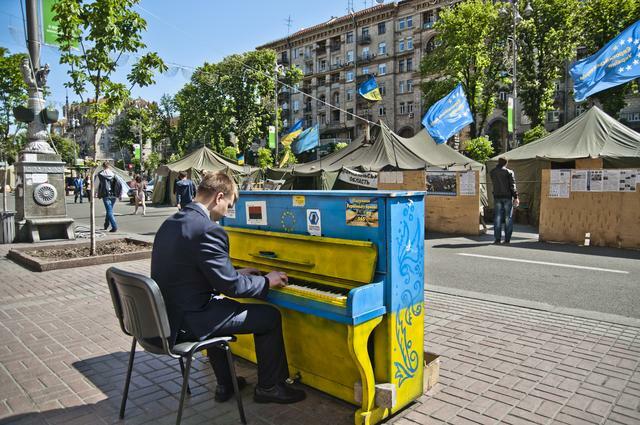 The piano traveled to Kyiv City Council building, and eventually arrived at the barricades of Hrushevskoho. A community of gifted pianists played the piano — the “instrument of freedom,” as it came to be known — wearing balaclavas. 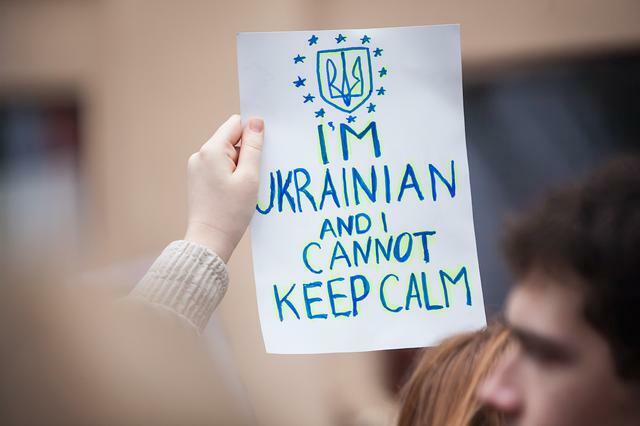 Activists in Lviv, Donetsk, Uzhgorod, Kirovograd, and other regional centers followed Kyiv, and yellow-and-blue pianos soon appeared on their streets. The piano became a symbol of revolution. 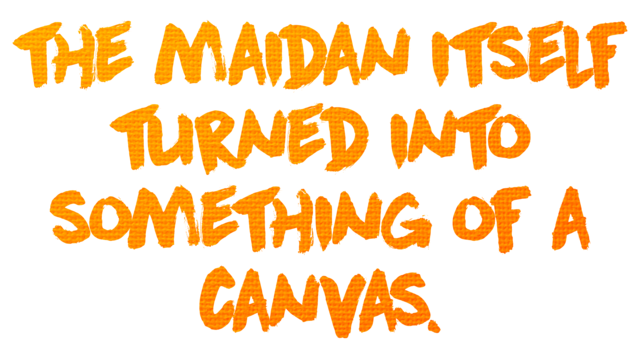 EUROMAIDAN, MUCH LIKE 2004'S ORANGE MAIDAN, was a creative phenomenon, inspiring books, poetry, films, songs, and artwork (much of it, surely, yet to be created). It’s worth noting that the anti-Maidan movement, like its cultural antecedent in 2004, relied on old Soviet and Russian songs. And therein lay the difference: anti-Maidan groups attempted to simply replicate Maidan. It is possible to copy the stage, tires, and barricades, but it is difficult to imitate creative outburst. Where are the anti-Maidan murals and graffiti? Where are the original songs and performances? Where are exhibitions of graphic works and photographs? Where are the separatist artists? Perhaps it’s possible that they exist and simply never earned any attention, but that seems unlikely; in an online, social media era, if anti-Maidan creativity actually materialized, it would inevitably become known. The humanities will be interpreting and analyzing the fractures of civilization across Europe at the start of the 21st century for years to come. 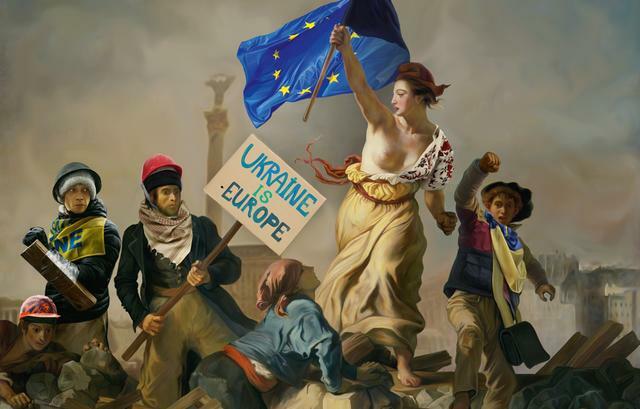 Euromaidan, and the Ukrainian Revolution that redrew comprehension of modern Europe, is an essential part of that conversation. As always, culture will be instructive. Natalia Moussienko is a Senior Research Fellow with the Modern Art Research Institute, National Academy of Arts of Ukraine, and a former Kennan Institute Fulbright Scholar.